New York Yankees first baseman Greg Bird was scratched from Thursday's spring training game because of swelling and stiffness in his right elbow, manager Aaron Boone said. Bird, who was hit by a pitch Wednesday by the Houston Astros' Wade Miley, was sent back to Tampa, Fla., for X-rays while the team played the St. Louis Cardinals in West Palm Beach. Boone told reporters that the X-rays were a precaution and he didn't want Bird to have to play through soreness. Bird, 26, has been competing with Luke Voit for the starting job at first base this spring. He is hitting .333 with 11 walks and three home runs in 51 plate appearances in the Grapefruit League this year. 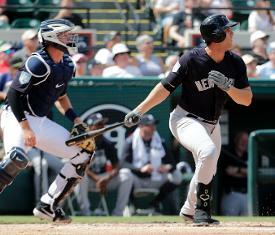 The left-handed batter hit .199 with 11 home runs in 82 games with the Yankees last season.